Lone Star Swing – Great group. One of my favorite moments of the day was when Paul Glasse, the mandolin player, ripped into an acoustic version of Air Mail Special. It was an amazing song, but I would love to hear a mashup with the Ella Fitzgerald version, with her vocals on top of Paul’s mandolin. Dan Navarro – I thought Dan was ok. Carrie really dug his version of We Belong To The Night. Sarah Jarosz – Excellent music. She rotated between playing the banjo, guitar and mandolin, which kept it fresh. Sarah is one of those teenagers who burst onto the scene, amazed everyone, won a bunch of awards, and is now touring the world. That is both awesome and a bit depressing. The Lovell Sisters – Three sisters, three instruments: mandolin, fiddle, dobro. They had some great vocal harmony moments, which I am always a sucker for. The Travelin’ McCoury’s – Best set of the day. Traditional bluegrass, performed by masters. Thinking back, I don’t have any particular favorite moments – it was like a huge wall of sonic excellence. The Travelin’ McCoury’s & The Lee Boys – This was an interesting experiment – a fusion of bluegrass and sacred steel. Their cover of Walking in Jerusalem was especially fun to listen to – I lost track of how many times they passed solos around. 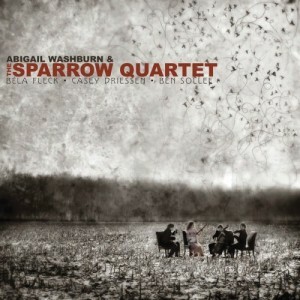 I honestly never thought I would be very interested in an album featuring two banjos, a violin, and a cello, and yet here I am declaring that my favorite album of 2008 is the self-titled Abigail Washburn & the Sparrow Quartet (YouTube, Amazon). Carrie and I saw them perform during SXSW last March, and it was my favorite performance of the whole festival. I’ve listened to the CD many times, and still thoroughly enjoy the so-ridiculous-it-wraps-back-around-to-incredible fusion of Chinese and American folk music. 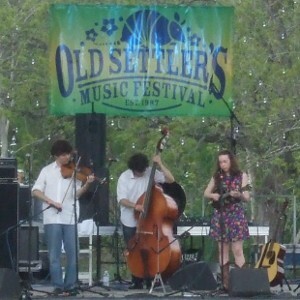 Abigail’s vocals are amazing, and I probably don’t need to mention that Bela Fleck’s banjo skills are superb. Casey Driessen’s violin is solid, and Ben Sollee alternates between making his cello sing and rocking out some fresh rhythmic sounds. Check out the overture that kicks off the album.